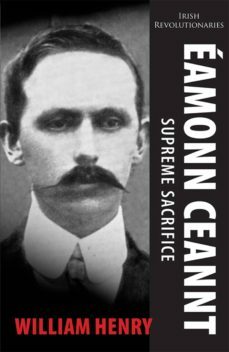 The only biography of 1916 leader and signatory of the Proclamation, Éamonn Ceannt. Éamonn Ceannt was executed at Kilmainham Gaol on 8 May 1916, along with Con Colbert, Seán Heuston and Michael Mallin, for their part in the Easter Rising. Ceannt was one of the seven signatories of the Proclamation of the Irish Republic read by Patrick Pearse outside the GPO on that Easter Monday. He had led the rebel occupation of the South Dublin Union, and despite having been vastly outnumbered his volunteers were not overpowered but ordered to surrender by Pearse. Éamonn Ceannt, together with Patrick Pearse and Joseph Plunkett, was instrumental in planning the rebellion. He had joined the Gaelic League in 1899, where he met Pearse and Eoin MacNeill. He became a member of the Irish Republican Brotherhood in 1912 and became a founding member of the Irish Volunteeers the following year. This is the only biography of this brilliant military tactician and key player in the story of 1916. William Henry is an historian, archaeologist and author of several titles including Coffin Ship, Hidden Galway, Famine: Galways Darkest Years, Forgotten Heroes and Galway and the Great War. He lives in Galway.